Zambia continues to be a beacon of light in the growth of democracy on the African continent. The country goes to the general elections in August this year under a new constitution that has significantly altered the electoral environment. The amended constitution now demands that for one to ascend to the office of president they must poll at least 50+1 percent of total votes cast and makes the position of city mayor and council chairperson electable for a period of five years. The right to participation of all citizens in the country’s politics is guaranteed by the constitution. 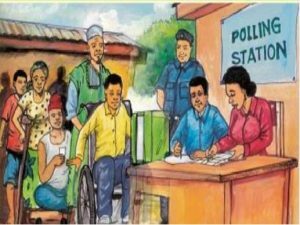 Persons with Disabilities have been fighting for recognition and protection of their rights to political and public participation through an inclusive and accessible electoral process. Zambia’s 2016 elections will not only be historical on account of the constitutional changes but also because it is the first time that the country will have developed and implemented measures to ensure that persons with disabilities effectively participate in the entire electoral process. The electoral commission was compelled through litigation and advocacy to produce an action plan and budget to ensure that persons with disabilities are catered for in this year’s election. The Commission has proposed to spend K2, 800, 000 an equivalent of USD250, 000 to procure 5, 600 ramps to be used by persons with disabilities in this year’s election. The commission has further proposed to spend K467, 000 an equivalent of USD42, 000 on production of information communication education materials targeted at persons with disabilities and engagement meetings with them. If Zambia succeeds to have such an accessible general election, the country may well be a model for other countries in Africa to follow. Disability Rights Watch, a leading human rights watchdog on disability in Zambia has been pursuing the enforcement of the High Court Judgment in the case of Selah Brotherton Vs ECZ case delivered by Justice Nigel K. Mutuna, On 19th Day of September 2011. In the judgment delivered in favour of persons with disabilities, it was established that the Electoral Commission of Zambia ECZ unlawfully discriminated against the Petitioner and other persons with disabilities represented by the organization on whose behalf this action was brought contrary to Article 23 of the Constitution as read with Section 19 of The Persons with Disabilities Act. The judgment showed that the ECZ had unlawfully limited the rights of the Petitioner and other persons with disabilities represented by the organization on whose behalf the action was taken to court, to exercise their franchise by not providing premises and services that are accessible to persons with disabilities contrary to Article 75 of the Constitution. Some of the orders contained in the judgment include that the ECZ erect temporary ramps for use by persons with disabilities in all polling stations, ensure that all polling booths are located on the ground floors of premises used as stations and in places accessible to persons with disabilities. The commission was further ordered to provide a tactile ballot guide for voters who are blind or are partially sighted but do not wish to be assisted in casting their secret vote in respect of all elections and not just the Presidential Elections. Disability Rights Watch managed to have the ECZ produce an action plan which includes a budget detailing the specific measures they will put in place to ensure that the 2016 general elections are accessible to persons with disabilities. DRW President Wamundila Waliuya said his organisation realized that there was now no need to seek judicial intervention but instead engage in a robust programme to monitor the implementation of the action plan and raise awareness of the interventions put in place to ensure accessibility to the entire electoral process by persons with disabilities. Mr Waliuya explained that in delivering judgment the judge had the option of directing the ECZ to postpone the elections on grounds of discrimination but opted instead to give the ECZ very specific orders to progressively make the entire electoral process accessible to Persons With Disabilities such that the 2016 general elections should be fully accessible to PWDs. “, I decline to grant the remedies as claimed because it would lead to the postponement of the elections scheduled immediate remedial action, but the said action as I have stated, if taken will lead to postponement of the election because the remedial action cannot be taken in the short period of time remaining before the polls open. I am therefore reluctant to take an action which would put the nation on that course for the following reasons. Firstly, and most importantly, the Petitioner and members of the organization are not the only participants and intending participants in the elections. Their individual and group rights and interests must be weighed against the rights and interests of the larger majority of the other participants and intending participants. From a purely common-sense positions, the interest of this larger majority must prevail. There are also other interests which in my considered view are paramount as against those of the Petitioner and the organisation’s members. These are the interests of other stakeholders in the electoral process such as the tax payers who have partially funded the elections, the general electorate, the co-operating partners, various election observers and indeed political parties who are geared, at great costs to participate in the elections. Secondly, by the very fact that the remedies are couched in such a manner that they require me to grant them immediately, which would require the postponement of the elections, there are an indirect attempt by the Petitioner to invoke the provisions of Section 28 of the Electoral Act.” Reads the judgment in part. “I feel Deaf issues still remains under or misrepresented. There is neither activity nor budget for Sign Language Interpreters during the course of entire electoral process, i.e. ECZ announcements/ advertisement on TV need to be accompanied by Sign Language Interpreter that is why there need to broaden diversity in the participation of DPOs in such a process. Provide a tactile ballot guide for voters who are blind or are partially sighted but do not wish to be assisted in casting their secret vote in respect of all elections and not just the Presidential Elections. In arriving at the said directive as it relates to (a) and (b) above, the judge was alive to the fact that the buildings used by the Respondent to house the stations did not belong to it. He was however of the considered view that the measures were realistic because, firstly, the ramps that the Petitioner has insisted on are temporary ramps which would have no effect on the structure of the buildings. Secondly as relates to location of the polling booths, the Respondent could specifically direct its agents to identify buildings located on the ground floor, which directive it had hitherto omitted to give such agents. The ECZ was ordered to ensure that it formulates and issue a detailed plan and budget aimed at providing services and amenities aimed at ensuring equal participation by persons with disabilities in the electoral process ahead of the 2016 polls. A meeting was convened with disabled persons organisations and wider civil society to look at the action plan and chart a way forward ahead of the 2016 elections. Civil society was very happy that DRW had taken a proactive stance to engage with the ECZ on the need to ensure accessibility to the electoral process. The meeting bemoaned the fact that the measures ECZ reported as done were not visible and doubted how the over ambitious budget the commission had drawn would be resourced. Concerns also arose as to the effectiveness of the processes proposed in the action plan such as audits of polling stations as there was no evidence that persons with disabilities would be involved. It was also not clear what audit checklists they would follow in the process and the nature of collaboration they had put in place with the Ministry of Education who are the owners of most of the infrastructure to be used as polling stations. Persons with disabilities resolved to play a more active role to monitor this year’s elections and to support the awareness raising efforts of wider civil society. DRW pledged to write to ECZ on the areas that needed clarity and to engage with FODEP in a process to review monitoring checklists and train monitors in disability inclusion.